We are frankly staggered by the lack of accurate and relevant figures and statistics relating to the Oldham West and Royton by-election, the lack of information dissemination from all political parties & the traditional press is staggering. All we have seen in leaflets and on social media is name-calling, intimidation and left versus right arguments with no evidentiary corroboration. 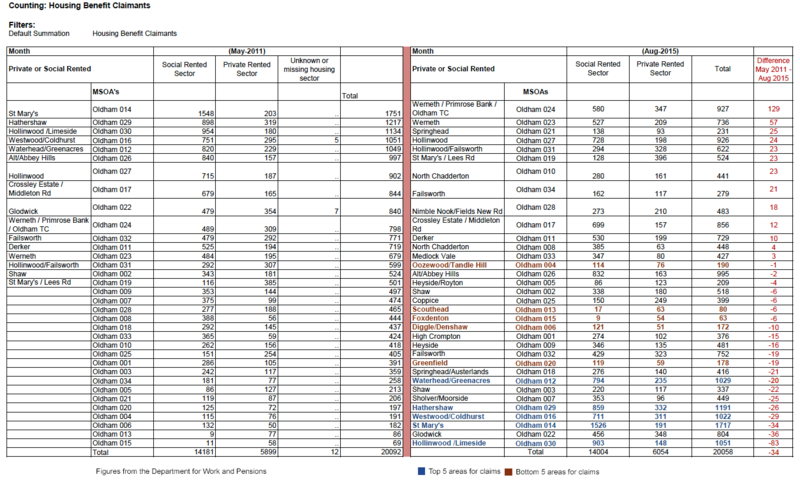 Here are the facts and statistics in all their pictorial glory, like it or not this is the social and economic climate of Oldham. 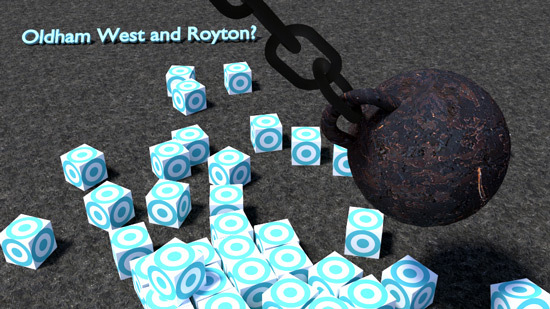 Oldham West and Royton has the tenth highest average award amount for combined working tax credit & child tax credit in the UK, the parliamentary constituency has 5200 people receiving an average £10,147 per annum or a cumulative £52.8 million of tax-payers money every year. Just another statistic not shared by any of the political parties all of which are brandishing about leaflets with completely inaccurate figures, the annual award of tax credits for all of Oldham costs tax-payers around £166 million. 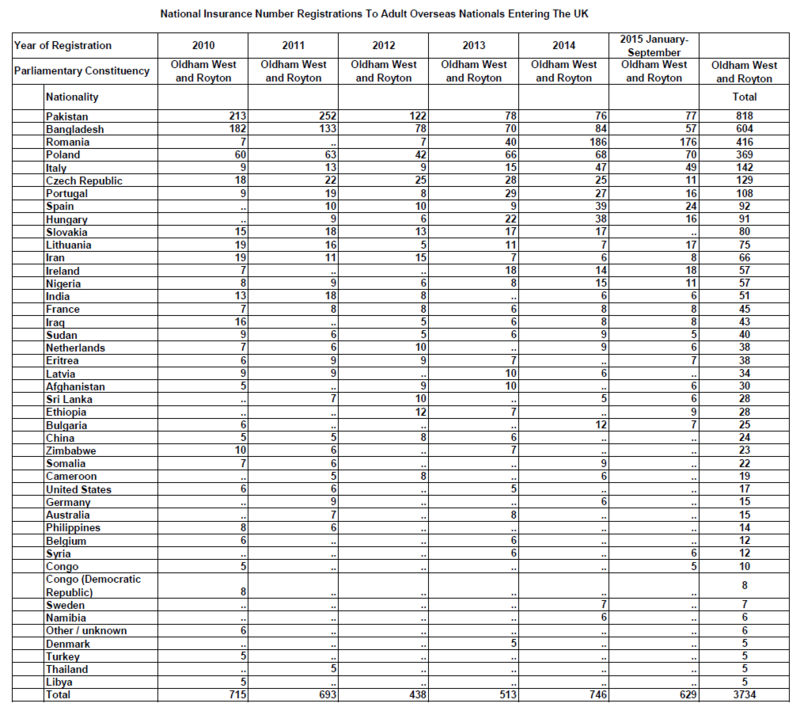 2013-14 are the last set of tax credit figures published, data for 2014-15 awards won’t be available till May 2016. 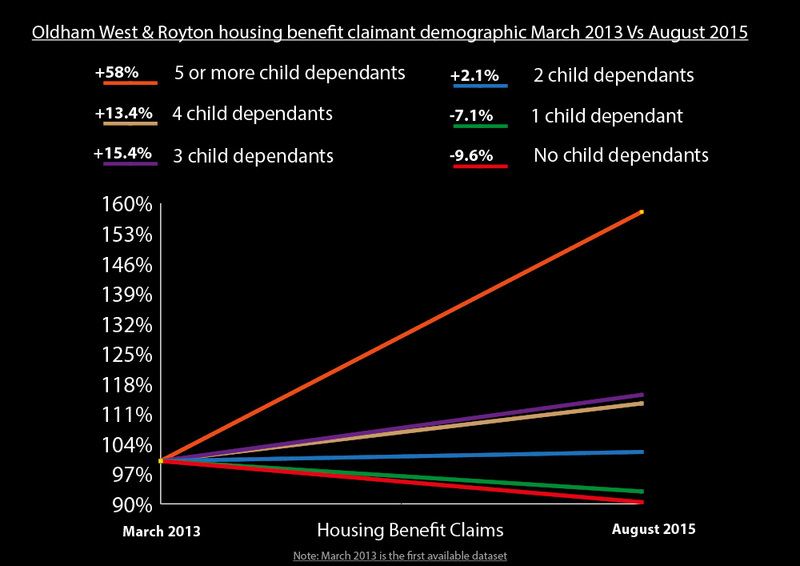 Oldham West and Royton tax credit statistics 2013-2014: Click picture to enlarge. Oldham is one of the poorest boroughs in the UK with pockets of extreme deprivation, it has long-term entrenched foreign heritage communities that are as much part of the Oldham landscape as the Pennines are. Recent unprecedented influx levels of the worlds poorest migrants into many of these areas has stretched resources and public services in Oldham to breaking point creating community tensions, a shortfall in available employment and is in the majority responsible for housing shortages. With hundreds of Romanian migrants now coming to Oldham every year the issue of immigration can no longer be a topic that cannot be discussed and neither can the connection to increased criminal and anti-social behaviour. Manchester, Salford & Oldham receive 77% of the total migrant inflow for the ten local authority areas that make up Greater Manchester. For the two University cities of Manchester & Salford for every 100 migrants that arrive in each city 66 leave Manchester & 52 leave Salford but for Oldham just 31 leave for every 100 that arrive. 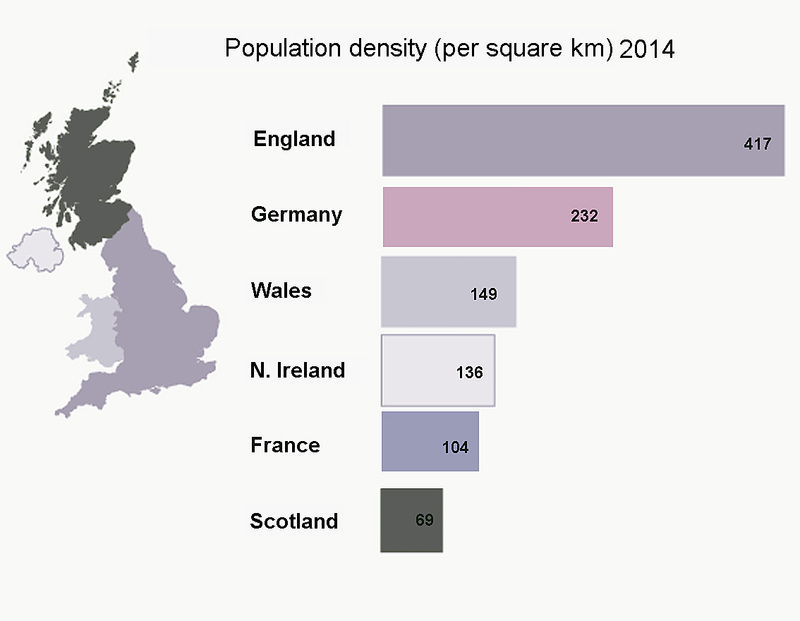 England is the eighth most densely populated country on earth. Councillor Dave Hibbert, Cabinet Member for Housing, Planning and Transport, said of Primrose Bank: “It has always been the council’s intention to build homes on this site. The finished properties would provide good quality family homes. The regeneration work that has already taken place at Primrose Bank, and other construction schemes, such as those at St Mary’s, Fitton Hill and Crossley, have transformed housing estates across Oldham.” As previously mentioned by Chronic-Oldham, and strangely enough not Councillor Hibbert, the four areas of Oldham that have the highest increase in housing benefit claims compared to 2011 are all PFI housing areas and Primrose Bank/Oldham Town Centre tops the list. 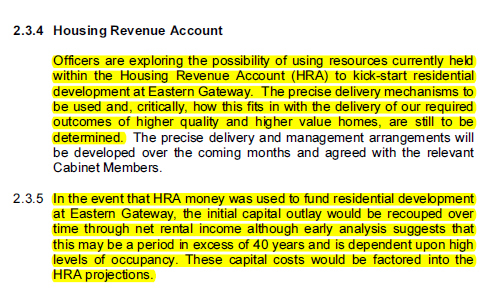 Oldham Council’s housing policy appears to be based on their flawed exponential population expansion model which increases revenue to the Council from Council Tax and expands the local economy via family spending but which also significantly expands the huge benefit bill, the demand for services, the need for employment and the amount of PFI & other long-term debt. 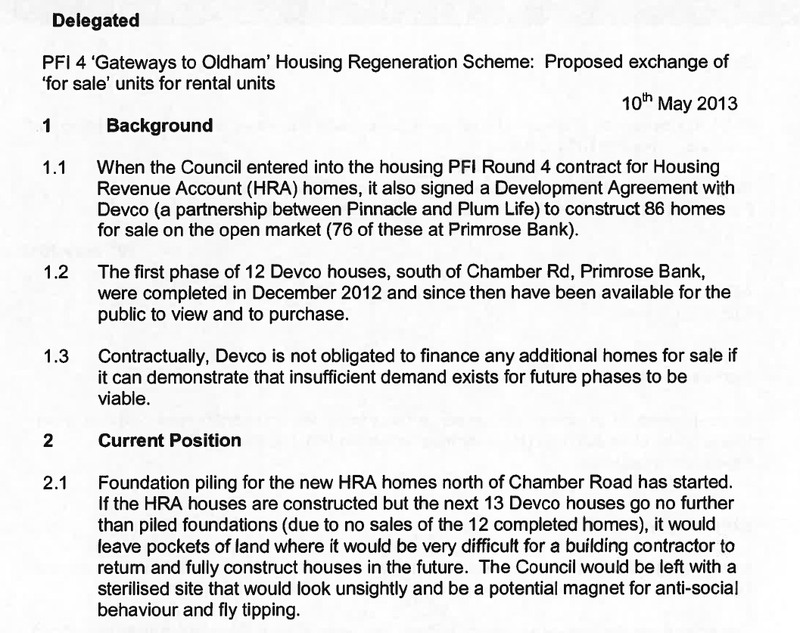 PFI housing in Oldham accommodating poverty but increasing the benefit bill. The Association of Greater Manchester Authorities stated in spatial framework documents in February that there are 25,000 inward jobs in the pipeline for Greater Manchester within 350 projects, the majority of which are in the finance & business sectors. As a member of the Association of Greater Manchester Authorities Oldham Council seem’s to have “jumped ship” again as it informs Oldham residents that transport & warehousing is projected to grow by 20 per cent in Oldham. Along with it’s co-op business partners & the utilisation of vast sum’s of taxpayer’s money, PFI & prudential loan resources Oldham Council is delivering the Foxdenton, Town Hall Cinema, Hotel Future, Prince’s Gate & Hollinwood schemes which if successful will only have the potential to provide a majority warehouse, domestic, retail, waiting & other hospitality job’s in the lowest paid UK employment sectors. If future generations fulfill their potential to be better educated they will find sparse provision for their new found skills in Oldham other than in the administration of Oldham Councils thriving poverty & population management co-op sub-sector. 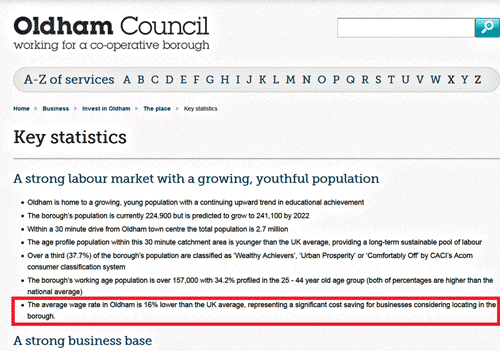 This page was displayed on the Oldham Council website up to June 2014 at which time Oldham average pay was 20.2% below the national average. Chronic-Oldham share common ground and oppose political policy with every political persuasion in Oldham we do not support or work with any political party of organization. We support the National Health Service we do not support a society where it is normal to get more in family benefits than taxes paid while the NHS struggles to cope with population numbers and funding shortages. 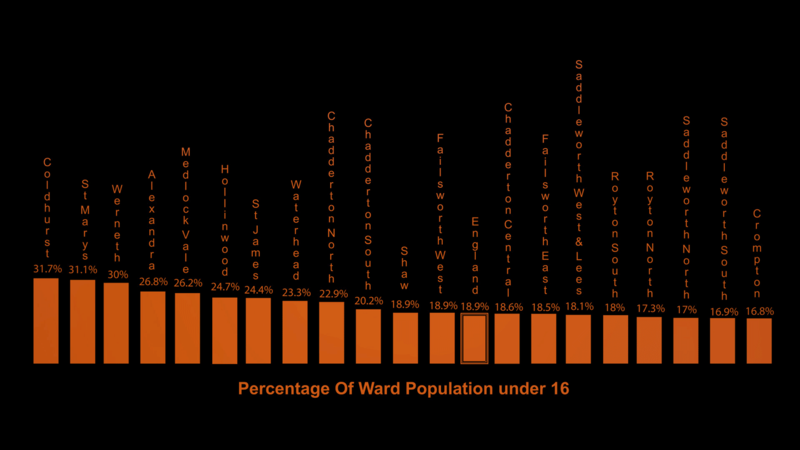 We do not support an international health service or the on-going NHS blame game ostracization of the aged for having the audacity to live too long while Oldham’s local hospital has to deal with the highest birth rate in Greater Manchester. We support state benefits we do not support the benefit state that pays out £166 million in tax credits in Oldham every year. We oppose a family benefit system which not only supports the genuine needy but drives the huge volumes of poor migrant immigration to Oldham and creates an underclass family demographic which works only a few hours per week. We oppose discrimination of mainly single unemployed people who are not entitled to tax credits but are criticized for not taking employment in Oldham which has the lowest average pay in all Greater Manchester pinned to the floor by the highest average tax credit payment in Greater Manchester. 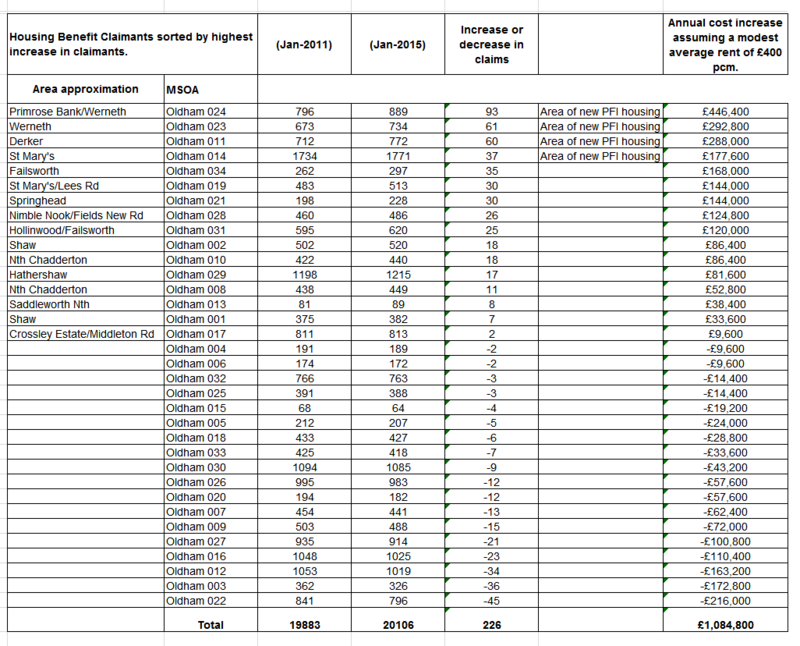 Job seekers allowance in Oldham in the financial year 2014/2015 cost £10.8 million. We believe in freedom of religion but we also believe in the right to live free from religion we do not believe that local or central government should fund it in any way. The NHS wastes up to £30 million a year on “spiritual services” if religion wants a presence in hospitals it should fund it itself. We believe the Governments academy school system is divisive and serves to highlight differences, schools should be a mixture from all walks of life, faith schools should not be funded with public finances. We have huge problems with the left wing politicians of Oldham who continue to expand the mechanisms of poverty by maintaining a borough where local government is as dependent on residents’ state benefits as they are. 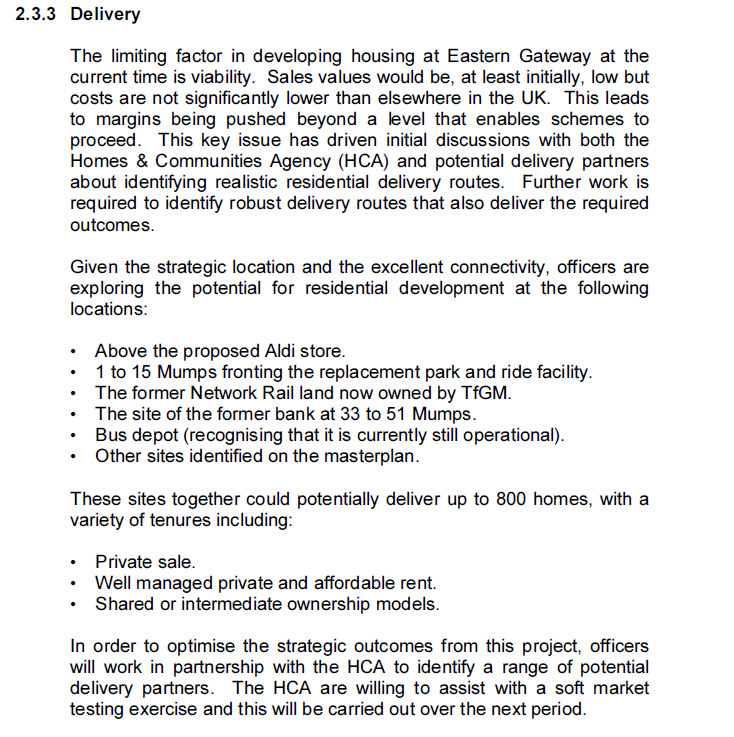 This is a borough run by disingenuous vague local politicians who expand debt and interest past the half a billion mark in the same localized hotspots in the name of regeneration and their poor core voter “family” demographic population. Comments such as the public support our regeneration are common place a case in point being the Town Hall Cinema paid for almost entirely by Council resources which saw the initial £10 million scheme become a £37 million scheme less than two years later, the reason target residents who will use the cinema don’t care about the expense can only be because in real terms they don’t pay any taxes to fund it. 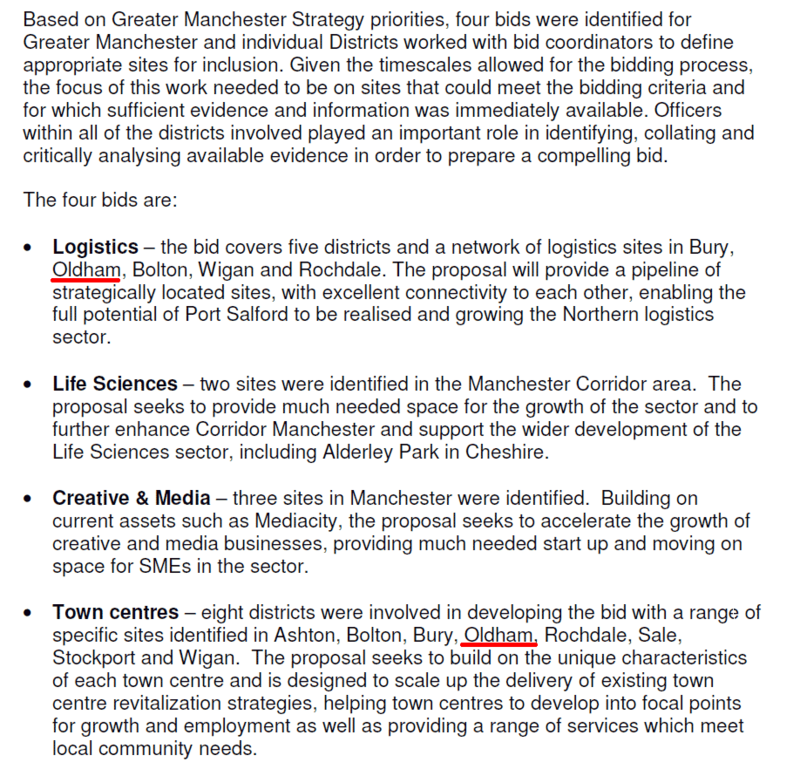 The entrenched Oldham oligarchy intend to exponentially increase these core voters to pay for seventy years of escalating debt repayment by funding multiple schemes in the lowest paid industry sector “wholesale and retail trade, transport, accommodation and food services”. July 2015 statistics show average weekly pay within this group was £138 lower than any other industry sector. This years crime statistics have shown huge increases in the levels of crime in Oldham but each release has been greeted by silence from politicians and the local press who chose to either say nothing or use generic averages for all of Greater Manchester. 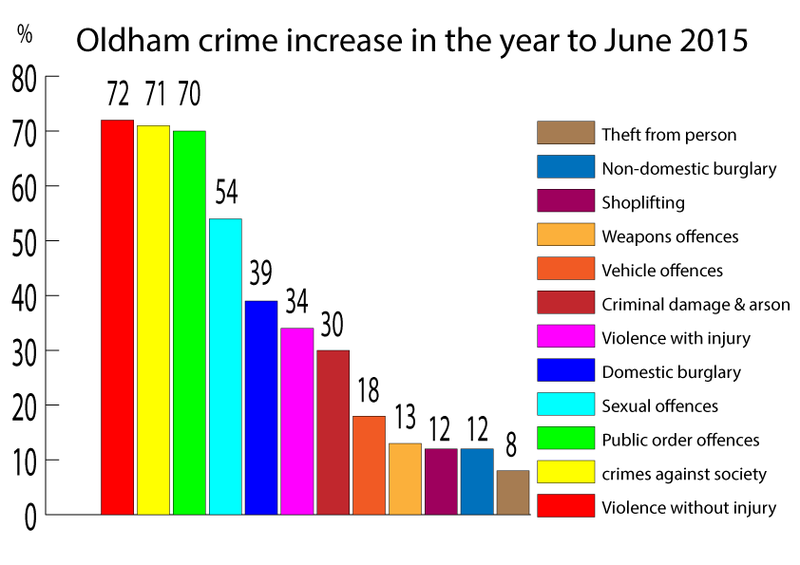 Oldham already has six of the top twenty shoplifting hotspot stores for all Greater Manchester due to its microeconomic culture yet tucked away in the Manchester Evening News in the last week was the news that Plate St on the Oldham Independent Quarter has the tenth highest crime rate in all Greater Manchester in 2015. Do Oldham Council think that keeping quiet about crime will ensure their hundreds of millions in regeneration and housing spending planned in Oldham Town Centre will remain unaffected? What all political parties and self-serving co-op partners need to learn is that fundamental human rights begin with the individual not the right to a family life, it is crass to make households earning over £60,000 eligible for tax credits while a single person working full time on minimum wage is entitled to none but is entitled to pay salary taxes that families collect in tax credits.